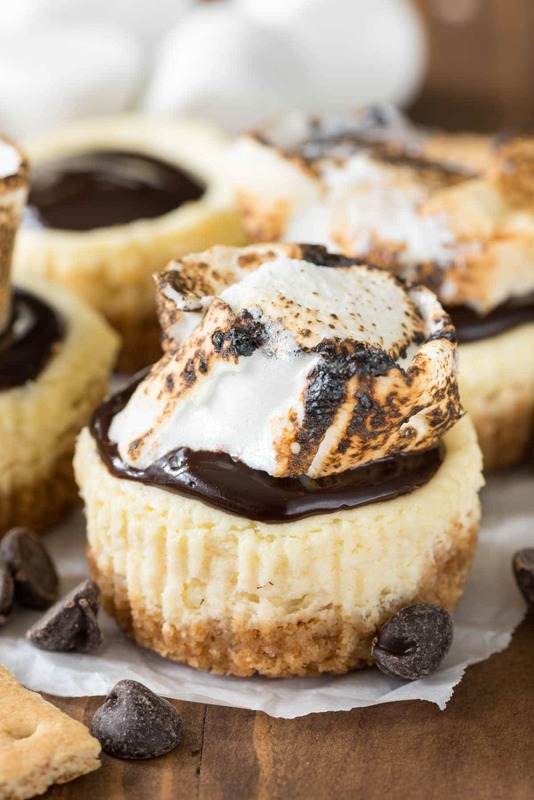 Mini S’mores Cheesecakes – I don’t know about you, but I crave cheesecake all year long. 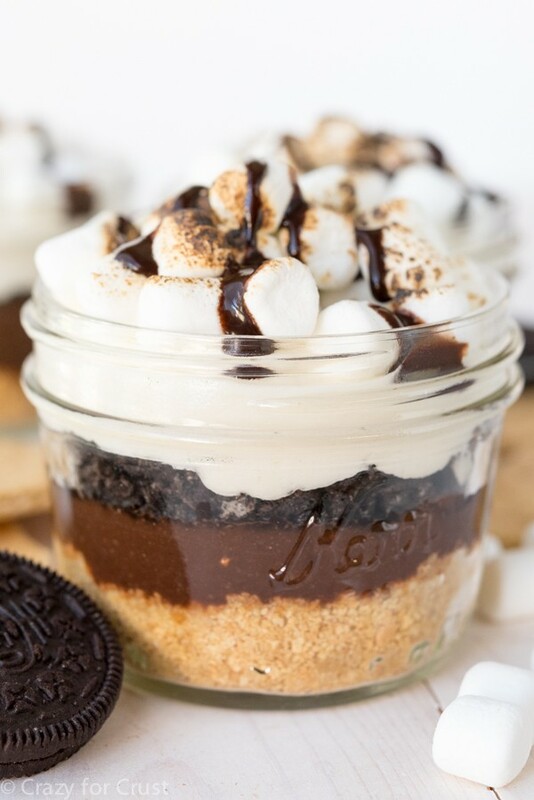 And when s’mores time comes around, I just make them indoor: Mini S’mores Cheesecakes! Jordan gets out of school in 6 weeks. 6 weeks!! Let’s stop thinking about how she’ll be done with 5th grade (gasp) but in 6 weeks I’ll have 8 loooooong weeks to look forward too. I have a love/hate relationship with summer. I love that it’s easy, no alarm clocks, do what we want when we want. I hate that when I start doing all those things I realize that I still have a job and now my 6 hour a day babysitting gig is gone. A few weeks ago a friend posted this on Facebook: Oh I just can’t wait until summer when these kids can be home with me ALL DAY LONG! I just love being with them every minute! I almost spit my coffee all over the screen (Okay, it wasn’t coffee. It was wine, you got me.) Now, I’m sure there are those people that really love being with their kids 24/7, every minute of every day. Those are the kind of moms that love crafts, sports, getting down on their hands and knees and playing Barbies and Legos, and they actually play at the park. Those people exist, and I admire those people. I wonder how they survive (drugs? wine?) and I wish I could be like them. I’m not like those people. I love my daughter with all my heart. She’s fun, she’s funny, and she’s a great little shopper. But 24/7? For 8 loooong weeks of summer? People, there’s just not enough wine in the universe. Is there anyone else out there like me? Because on social media, all of the people are like that friend. Thank goodness for summer camp. Anyway, the thinking about summer got me thinking about summer things, like the beach, the pool, and s’mores. We all know I’m not an outdoor s’more person unless it’s at a resort with a fire pit, so I stick to doing indoor s’mores. I rarely eat traditional s’mores; I make pies and cookies and pudding. And now? Now I’ve made cheesecake: MINI S’mores Cheesecakes! This is a super simple cheesecake recipe (no fuss, no springform pan, no water bath) and you bake it up in muffin tins so it’s perfectly portioned. You get 12 cheesecakes, perfect for a party! Or, you can freeze them and eat them one at a time for 12 days straight (not that I’d know anything about that). Then, you top your cheesecake with chocolate ganache (or hot fudge ice cream topping) and a toasted marshmallow. But wait, you ask, how do you toast a marshmallow without a fire? Well, I did these with my kitchen blow torch. Or you could toast them over a gas stovetop. Or broil them for a few seconds, then place them on top the cheesecakes. 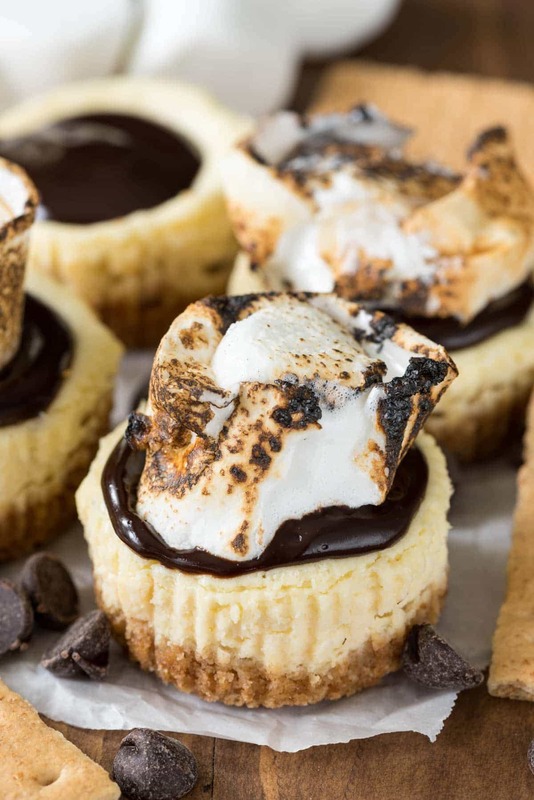 This easy Mini S’mores Cheesecakes recipe is perfect for any occasion, summer or all year long. 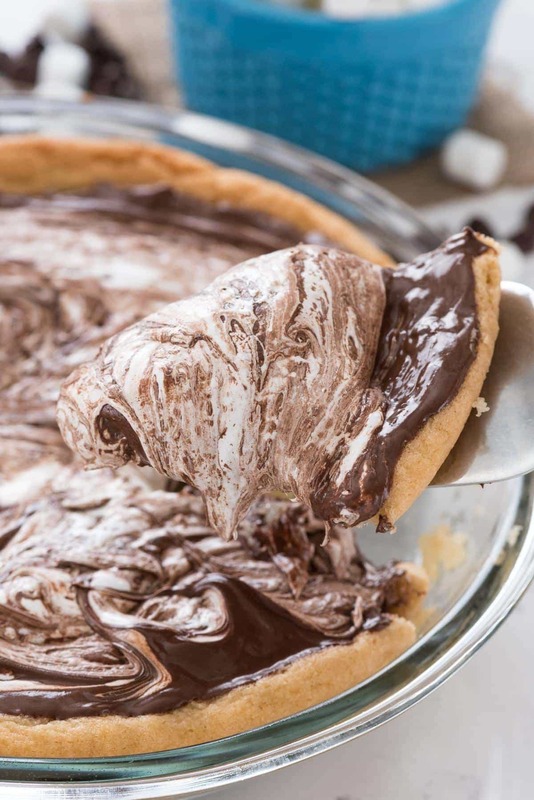 That chocolate and gooey marshmallow gets me every time! This easy recipe makes a perfect 12 Mini S'mores Cheesecakes! This is the perfect indoor s'more recipe for cheesecake lovers! Preheat oven to 350°F. Line 12 muffin pan holes with liners. Stir together graham cracker crumbs, sugar, and melted butter. Press about 2-2 1/2 tablespoons of the mixture into the bottom of each muffin liner and press to compact. Make the ganache (about 2-3 hours before you're ready to serve): place cream and chocolate chips in a microwave safe bowl or measuring cup. Heat for 45 seconds, then whisk until completely smooth (may take more or less time depending on your microwave). Let sit until it's thick enough that you can spread it but it's not drippy. To assemble: spread ganache over the chilled cheesecakes. Toast a marshmallow over a gas stove or BBQ and place on top (or use a kitchen torch). Serve immediately after you've placed the marshmallow on top. Cheesecakes can be made and frozen for up to one month before topping. Once topped with ganache and marshmallow, serve immediately. This post has been sponsored by Challenge Cream Cheese. All opinions are 100% my own. These cheesecakes would be so fun to make!! 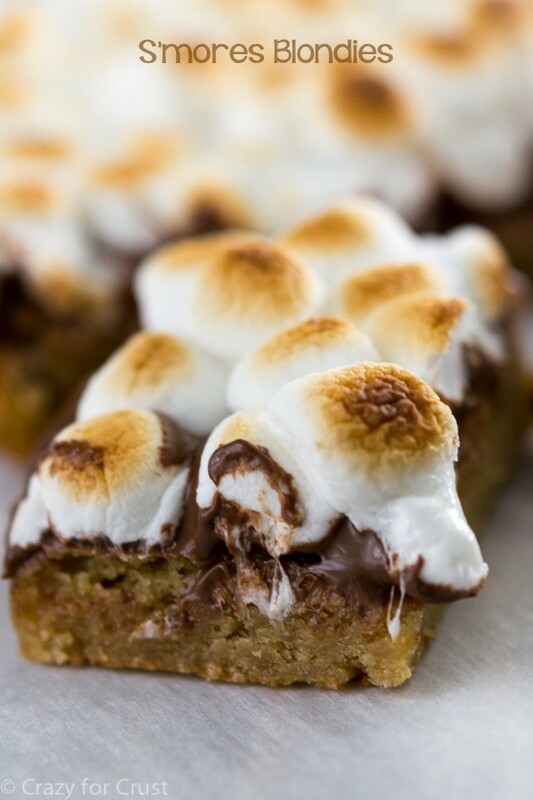 I love anything s’mores and could easily gobble down 2 or 3… or 5. Who’s counting anyway! I can’t resist anything s’mores related! Love the toasted marshmallow on top! Oh thank you so refreshing to hear! I do not have kids right now but I know I totally would be right there with you and that makes me feel better to know that I would not be alone! Nor a bad parent 🙂 And wine..I feel ya there..now if I could just reach into my screen and grab a cheesecake we would be all set…like I want marshmallow all over my face right now. Cheesecake is not my favorite thing but oh man do these little bites look amazing! Yum! I think these put the regular smore’s to shame! Gosh these look SO good! I could just sink my teeth into one… or three right now! these look amazing…cant wait to try! I’ve made these cuties and I went crazy over them. They were really delicious! Thanks for sharing!! These look fantastic! Would love to make them for my kids bake sale. Can I bake and torch them the night before? How long do they keep? Great job on this post, love the photography and food!